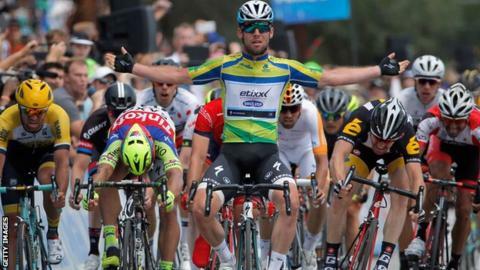 Slovakia's Peter Sagan won the 2015 Tour of California by just three seconds as Britain's Mark Cavendish claimed the final stage on Sunday. Cavendish, 29, won the eighth stage sprint from Los Angeles to Pasadena with Sagan coming home in third place. Etixx - Quick-Step team-mate and overnight leader Julian Alaphilippe had agreed to "go with the original plan" and help Cavendish win a fourth stage. It saw Alaphilippe finish three seconds behind Tinkoff-Saxo's Sagan overall. The French rider, 22, had taken the race leader's yellow jersey by winning Saturday's seventh stage that finished on the upper slopes of Mount Baldy. But with bonus seconds on offer at an intermediate sprint and finish line on Sunday's finale, Sagan, who is a faster sprinter, was favourite to take the title. He cut Alaphilippe's lead to one second at the mid-race sprint - crossing the line second behind Cavendish but crucially ahead of the race leader. And Sagan then came home third in the bunch sprint to pick up four more bonus seconds, while Alaphilippe was awarded none for finishing 12th. "I did the best sprint possible both in the intermediate sprint, and at the finish, to try and take away the seconds from Sagan," said Alaphilippe, who had the consolation of being the best young rider (under 25) in the race. "But it was pretty impossible to beat him. I'm not disappointed. I considered wearing the yellow jersey into the final stage like a bonus." Cavendish, who next heads to the Tour of Suisse before racing at the British National Championships in Lincoln from 25-28 June, added: "I'm super proud of what we've done here and think things are going in the right direction ahead of the Tour de France." Sagan, who won two of the eight stages, finished second three times and third twice, said: "It was close. I did surprise myself. I almost thought I didn't do it. I am very happy for the victory."